This kit measures the performances of airfoils. In the first experiment, the air resistance few and the lift FA of an airfoil are measured as a function of the angle of attack α of the airfoil against the direction of flow. In a polar diagram, FW is graphed as a function of FA with the angle of attack α as the parameter. From this polar diagram, students can read the optimum angle of attack. In the second experiment, the students perform comparable measurements on airfoils of their own design. The aim is to determine what form an airfoil must have to obtain the smallest possible quotient FW/FA at a given angle of attack α. 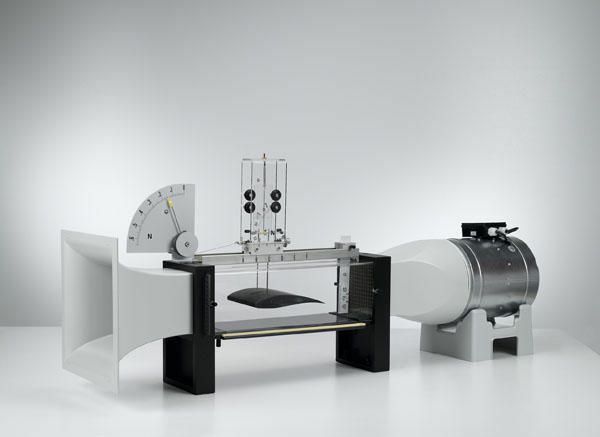 Ordering information: This kit includes a wind tunnel, suction and pressure fan, measurement trolley for a wind tunnel, aerodynamics accessories, and 0.65 n sector dynamometer.